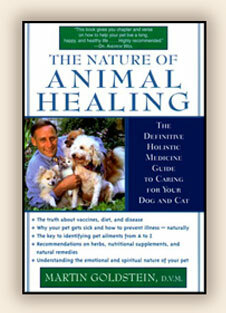 Animals Healing.com - The Nature of Animal Healing by Martin Goldstein, D.V.M. For two decades, Dr. Martin Goldstein - one of America's most successful, renowned holistic veterinarians - has healed and helped his animal patients with the same natural therapies that benefit humans. The results have been so astounding that today critically sick pets are brought to him from across the country for a new chance at life and health. Plus - a comprehensive resource guide for holistic pet care including: veterinarians, product manufacturers, books, newsletters, magazines, associations, and more! "This book gives you chapter and verse on how to help your pet live a long, happy, and healthy life… Highly recommended." Dr. Martin Goldstein's Smith Ridge Veterinary Center is in South Salem, NY. He earned both his B.S. and his D.V.M. from the Cornell University. He was certified in veterinary acupuncture by the International Veterinary Acupuncture Society in 1977, and in iridology in 1981. He has many happy and healthy dogs and cats, all of which are living proof of the philosophy contained in this book.